The phone beeps in the office, and a long stream of Japanese is emitted from the speaker. My ear picks out the words "principal’s office". I look at the time, 7:50am. I glance at the calendar, one day before payday. Using these clues I suss out that the teachers in the staff office should report to the principal's room in order to receive their paystubs. I walk down to the first floor and wait patiently in line. Then, when it is my turn, I enter the room, receive the envelope from a 68-year-old Japanese nun with both hands, bow, and leave. The voice in the back of my mind muses at how long this situation will go on before she is done. Then I remember that Japanese nuns are made of steel and I will probably bite it before she does. I head up to the office in preparation for another day. Ten years ago I was working for Canada Customs, finishing my degree in History, and 5 years into a relationship that was, at the time, separated by the Pacific. I had spent several years looking at the lifers at Customs and their endless calculation of time served, banked holidays, and extra sick days that determined when they could retire. That was not for me. Off I went on an adventure to Japan to be with my wife, save some money, and figure out what I was going to do next. I'll give it a year I thought. Class A is up first. The sports girls. They attend my school because they play either basketball, volleyball, soft tennis (a softer rubber ball), or naginata (a martial art). They practice from 7:00-8:00am, study until 3:40pm, then practice again until 8:00pm. Then on weekends they either practice all day or attend games and tournaments around Japan. Our soft tennis team won the All Japan cup this year, for the second time in 4 years. All of the clubs are the top team in the prefecture. We are a powerhouse. I open the door at the bell and walk into their class. 30 of the 36 girls are sleeping, 4 are doing homework, and 2 of them are doing some kind of stretching that involves a pose that does not conform to the ladylike image we preach. She peers at my through twisted appendages and says "Good morning Allen-teacher". Of course that didn't happen. Married the next year, a daughter the next, and I was back doing something I SWORE TO GOD I would never do, and I went back to school. I got my masters in educational science at night while working, and then had a choice to make. Do I go into tertiary education, perhaps make more money, but have to a weather constant shuffling of positions, hustling for classes across various universities, and being let go once they had to pay me health insurance? Or do I take the safer route and accept a position at a private school, but give up incredible amounts of time. Well, I am a risk-averse personality, so I took the private school gig. After three years I was offered tenure, and this April I received a full time contract that, for the first time in Japan, did not have an end date on it. Ten years of work, two kids, and I did it! Next is class B. The doctor course. 20 kids out of a school of 1200, picked as this year's brightest and best. The pressure on them is immense as they are studying to enter Japan's best schools. Osaka University, Nagoya University, and once every few years, Tokyo University. To do so would put them on track to work in medicine, and add another notch to the belt of the admissions department. "Look!" they say, selling dreams to the parents of elementary school students, "come to our school and 6 years later your daughter could also be going there!" Class B studies from 8:00am to 7:00pm six days a week. Then they do homework. Excellent at listening, asking them to express an opinion on something leads to a blank look on their faces. "Teach me," their gaze says to me, "fill my head with knowledge to be regurgitated and then forgotten." My buddy Rob has a wife that works full time. So does my hockey friend Sean. My wife takes care of her family, as there are seven of us in the house. One of the great dilemmas was whether I should live with the in-laws and give my kids the chance to grow up in a large house with a huge garden, or leave her elderly family and raise our kids in a small apartment. I chose the former, for better and for worse. My father-in-law is a baseball-loving farmer that worked as a city hall civil servant and now enjoys a sweet pension. He now grows rice and vegetables and takes care of his mother, now 96 and still capable of downing a big mac between lunch and dinner. The mother-in-law... well... she sees everything, and files it away for later. Lunch time. I head to the teachers room with my beef and rice. I scroll through the news on my ipad when a teacher, who I have worked with for 6 years, suddenly comments "Allen-sensei you are good with chopsticks." My eye twitches involuntarily. I smile and reply that it is not an uncommon skill. I turn back to the ipad. It isn't as though I believe I am Japanese. One look at me is enough to scare preschoolers in to their mother’s arms. It's just that... one would think that after years of working with someone, that your combined experiences would take your relationship to a slightly deeper level than "lets comment on trivial differences!" But it doesn't, and this is one of the great paradoxes of Japan. A country with such a long history, with elegant and sophisticated cultural practices, with religious tolerance and wonderful art, can be reduced to the basic common denominator when dealing with an identity that is slightly different. My friends and I always said "if you don't like it, leave." And in a way that holds true. But after ten years and roots in the ground, that is easier said than done. Class H, adorable, lively, rambunctious, and the last class on the totem pole. They have been gathered together not out of great ambitions or plans, but as a quarantine so that they do not infect the rest of the more promising students. We lead off the class with a newspaper article which mentions stalking. Obliviously I read through the word and the class erupts in laughter. "Allen-sensei, STOCKING?!? Like this!" simultaneously dowdy skirts are raised to unacceptable heights and black nylon legs of all shapes and sizes flash out. I pray that the nun is not walking by and regain order. The simple word ends up on a tangent that discusses everything from stockings at Christmas to uniforms in schools in Canada. The English CD doesn't leave my desk. When I reflect upon the past ten years in Japan, it feels as though I have always had something to strive for. Establishing myself, going to get my masters, getting a better job, and then earning tenure. Accomplishing these things made me feel alive, and the fact that I was in Japan was really secondary to all of it. I could have been doing these things anywhere. Now, at the ten-year mark, I can only see the next 25 years of work spooling out in front of me. Like the Customs agents of old, I sit at my desk calculating furiously. I wonder whether this antsy feeling I have now is a phase, or if it is something that will grow and grow. At the station, heading home. I enter the first car, see one of my students eating ice cream from the convenience store located inside the station. Proper Catholic schoolgirls do NOT EAT ICE CREAM ON THE TRAIN. She sees me and quickly tucks the half-eaten ice cream into her bag, immediately ruining her homework. I sigh, realize she is class H, and move along to the next car... After all, I can't drink my train beer in front of her, can I? And these mayonnaise Pringles are looking mighty tasty. 5/5 Love your blogs, Always interested in what life for you is like in Japan. What area of Japan do you live in? Wow very interesting story and well written. Please keep writing more! I bet people's jaws have dropped. Also, lol at class H. Sounds like the most important class from the bunch tbh. It's interesting to see how the different classes are split up and such. What usually happens to these students? Do they just go straight to the workforce after high school? Really interesting post. Thanks for a little bit of an insight as a Foreigner in Japan. I wonder if you think that Culture of viewing everyone but Japanese as the "other" will change? Is there a difference in how the young people see you and how the older generation see you? Really enjoyed the writing. It brought your experiences to life for me as well as highlight some of the cultural differences between Western nations and Japan. Great blog, man. Fantastic, in fact. 10 years wow ... Great blog and writing sir!! It does not seem like it's been so long. Much has changed but you sir are still amazing!! All the best and I hope to meet up with you at some point. In our life's journey... All the best to you and your family!! It's... middle age. You've worked hard to get where you are, and you look forward and you see... more. It's a feeling like you've accomplished so much, you should be done. But there's still more in front of you. Well, yeah, but then the future like the past may still hold many new things and challenges, so what you're seeing in front of you may not be what actually happens. I mean, hell, you're in Japan. Aren't you due to teach a class full of espers trying to save the world from evil magician mecha pilots aided by vampires or something? Joking aside, interesting blog and cute kids. I wish naginata teams were a thing in the US. And these mayonnaise Pringles are looking mighty tasty. Think Lorning has just booked a flight to Japan! Excellent blog Manifesto, love learning about people who have the balls to leave their own easy habitat and make a new life in a foreign country and be successful at it like you clearly have. Your day to day life seems very rewarding though, just like everyone though i know we all wait and calculate and try to retire as early as possible. But hey, the day will soon be upon us and the day we wish we were 30 again will also fast approach us, so just need to relax and savor every bit of time! I live in southern Osaka, by the big international airport. They are adorable. 99% of our students go to a university, but there is a big prestige and money gap between the public and private universities. H is going private mostly. But they are pretty awesome. Not for the foreseeable future. The "other" is heavily celebrated in media and re enforced even by English teachers. It is something I will have to get over myself I think. I am so goddamn old when TL is telling me "its middle age".. But yeah. I am just at a plateau right now, and ten years is a pretty significant number. I will work on those espers. Don't! They are the devil! I had to balance them out with some "Chicken Nugget Dipping Sauce Pringles" the other day. Well, I'm just thinking it's similar to what I've been looking at in far more pedestrian circumstances (no giant robots for several hundred miles around here) in that you get so far in a career you've chosen, and then you start to understand why those old guys seemed to be so caught up in watching the days tick down to retirement. But there's always the option that you get your steam back going and keep pushing. At least I hope so, because I've got another 7 years until the earliest I can retire and another 17 for me to get the best possible. Disclaimer: I'm two years from 40, and am jealous of your access to mayo flavored pringles. woahhhh, I totally don't need that in my life but I want it. Easily one of the coolest blogs I've read on TL. Holy poppin Pringles Manifesto. 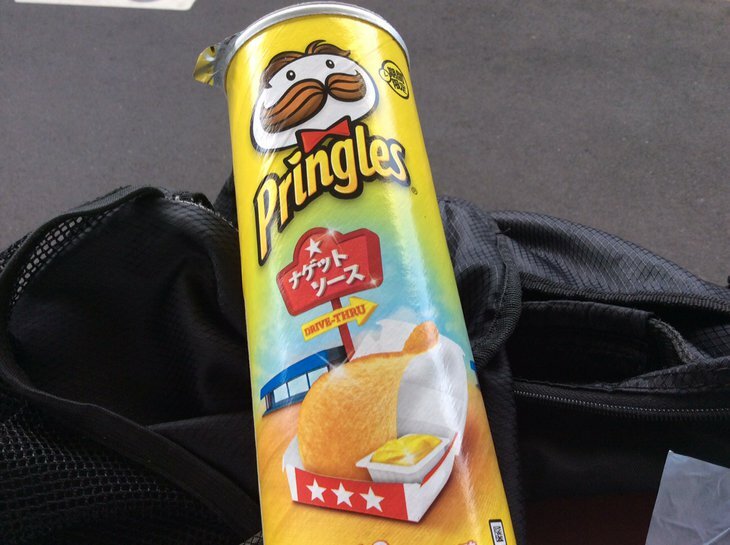 Congrats on ten years, and have a fun time with the delicious Pringles.